Reflexology is a non-invasive touch therapy. Based on the principle that reflexes (points and areas) on the hands, feet and lower leg correspond to internal organs and other physical structures. 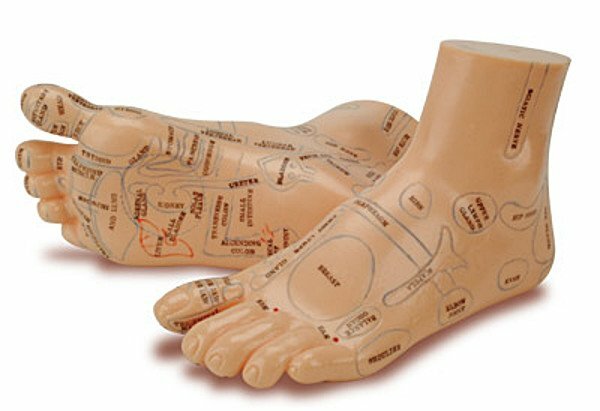 The Reflexologist stimulates specific places on the foot according to a “micro map of the body” to access the organs, muscles, bones, nerves, lymph nodes and glands of the body. It is now estimated that 75% of ailments, injuries, aches and pains are present due to stress. Reflexology allows the body to release that stress enabling the body to repair and heal itself. The combination of relaxation and the physical changes during a treatment places reflexology as an effective treatment for stress related issues, heel spurs, sore muscles, headaches, sinus issues, digestive issues, depression, menstrual issues, injury recovery, pregnancy and many, many more illnesses and conditions. Reflexology treats the whole person by bringing harmony to the physical, mental and emotional, it considers the whole person rather than just focusing on one illness. It can support people living with chronic conditions, as treatment for acute issues and as a prevention and maintenance program. Reflexology is very effective in supporting women and couples through the journey of fertility, pregnancy and postpartum. It is suitable for everyone, all ages, young or old. Professional Reflexologists work holistically with their clients and aim to work alongside allopathic (traditional western) healthcare to promote better health for their clients. They do not claim to diagnose, cure or prescribe. Reflexology dates back thousands of years and many cultures have contributed to the practice. The oldest evidence of reflexology is from Ancient Tomb drawings from 2500 BC depicting feet being held and massaged. Over time this practice spread to Greece, Arabia then onto Europe through the Roman Empire. Forms of Reflexology were also practiced in Ancient India by Buddhist monks who migrated to China and India. Western reflexology emerged in the late 18th Century, with scientists proving the neurological relationship that exists between the skin and the internal organs and that the whole nervous system adjusts to a stimulus. Further work by Dr William Fitzgerald created zone therapy, from that, in the 1930’s Eunice Ingham refined Dr Fitzgerald’s work and developed what we know as ‘western reflexology’. She observed that congestion or tension in any part of the foot mirrored congestion or tension in a related part of the body. Using this knowledge, she created the foot and hand maps that most reflexologist use today. Reflexology in its current form is practised worldwide. Its aim is to return the body to a state of internal and external balance. Reflexology has been known to assist in the relief of a wide range of health symptoms – everything from aching feet to headaches and helps to restore a sense of balance in mind, body and spirit. Reflexology can help with just about anything. Reflexology is a safe effective specialised form of massage. The whole of the body may be worked through the feet, hands or ears bringing about homeostasis enabling the body to heal itself and calm the mind and emotions. At The Reflexology Studio we use a range of applied reflexology techniques targeting any problem areas or health issues, acute or chronic. We provide a personalized treatment and collaboratively develop a treatment plan. Reflexology is used for general ‘wellness’ maintenance. You don’t have to have specific symptoms. It a very relaxing treatment, perfect for ‘you’ time and putting a bounce in your step. What research is there about the effectiveness of Reflexology in infertility? There are no guaranteed answers when it comes to infertility but relieving stress and rebalancing the body helps. Reflexology helps regulate the hormonal cycles helping normalise the menstrual cycle enabling the body to be receptive to conception; helping make babies naturally. A study in Denmark enrolled 108 women who had been diagnosed as infertile for at least 2 years and had no previous children. 47 withdrew from the study, the remaining 61 were given reflexology treatments for 8 months, twice a week and in the second half of the study, two treatments prior to the woman’s ovulation. Nine of the women (15%) became pregnant after 6 months, and all of the other women who had menstrual or ovulation abnormalities, completely recovered from their symptoms. Is it safe to have reflexology in your first trimester of pregnancy? First trimester reflexology is a safe, beneficial therapy but many Reflexologists choose not to see clients during this time. There is absolutely no evidence to suggest that reflexology can cause miscarriage but since miscarriage is sadly statistically more likely to occur during the first trimester it is important that YOU are happy to proceed. It’s important that pregnant women seek accredited Reflexologists. A list of these are available at the Reflexology Association of Australia website. A Reflexologist or midwife specialising in maternity reflexology will know which points to stimulate and the ones to avoid. At The Reflexology Studio we wholeheartedly believe that reflexology is very beneficial in the first trimester of pregnancy because it helps work on the endocrine system, essential in the development of the foetus. As a qualified reflexologist practitioners we have been trained in maternity reflexology. Conversely, Reflexology in the first trimester may be a helpful tool to reduce stress and anxiety for clients who have suffered multiple miscarriages. Reflexology is also beneficial for women who are dealing with miscarriage, as this natural therapy will decrease anxiety and stress, harmonise the mind and body and induce relaxation. How do I know if I am seeing a real Reflexologist? Be aware that there are a number of qualified remedial massage therapists who have studied a module of reflexology very briefly as part of their schooling to become remedial massage therapists. A fully qualified reflexologist will have undertaken a 12-18 month course purely focusing on reflexology. A real reflexology treatment consists of precise pressure being applied with fingers and thumbs on specific reflexes found all over the entire foot to decongest the body for improved health and well-being. If you want to be certain you are seeing a real reflexologist check they are registered as a professional member with the Reflexology Association of Australia (RAoA). If they are registered you can be sure they have undergone specialized training in reflexology. What’s the difference between Reflexology and Massage? Reflexology only focuses on the feet, hands and even face and ears in some cases where massage covers the whole body. In reflexology you only need to remove your socks and shoes but in massage you have to remove all your clothes. Reflexology can be done on anyone with mobility issues, the practitioner just needs access to the hands or feet. It can be done in a hospital setting, sitting down, standing up or lying down. Reflexology is a holistic treatment working on and affecting every part of the body, organs, glands and muscles. The aim is to balance the body and improve functionality. It also has a huge impact on the emotional state of the body, helping release stuck energy and emotion. Standard Remedial and Relaxation massage just focuses on releasing and relaxing facia and muscle tissue. Is there any research on the effectiveness of Reflexology? Kunz and Kunz are one on the main groups that do Evidence-Based Reflexology Research and have published a book. Health Professionals and Researchers (Kunz and Kunz, 2008, RRP Press, ebook, 224 pages). 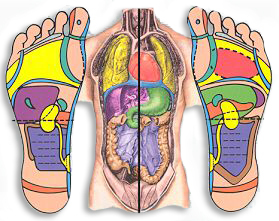 One of their assessments of the 170 studies showed nine areas of effectiveness for reflexology application: relaxation, pain reduction, ameliorating of health concerns, improvement in blood flow, aid to postoperative recovery, impacts physiological measures such as blood pressure, enhances medical care, eases pregnancy, delivery and postpartum effects, benefits mental health, eases and complements cancer care. There are also further links to other case studies showing the effectiveness of reflexology. Is there anything I need to do after a reflexology treatment? Reflexology increases circulation and lymphatic movement and encourages the toxins and nutrients to move around the body. To gain maximum benefit from a session you need water to help the detox process work. It often helps to avoid alcohol after a session. Reflexology can reduce the detrimental effects stress can have on your body and can alleviate insomnia for a restful night sleep essential for your body to repair itself. If there are imbalances within the body, then when the associated reflexes in the feet are manipulated it may be tender. The aim is not to cause pain because that itself stresses the body. If a point is too tender, then the reflexologist will reduce the touch. There will be communication between the therapist and client to ensure that the client is comfortable. The aim is to have a relaxing and restorative reflexology session. There are some techniques specifically for Muscles Release that may be used that could be tender but as with remedial massage sometimes you must dig deep to relieve the tight muscles. What can I expect during a reflexology treatment? At the Reflexology Studio, a treatment will begin by taking your health history and discussing any issues or pain you might be experiencing and your expectations from the session. This enables the reflexologist to create a personalised treatment to deliver the best results. You will have to remove your socks and shoes and then lie on a soft massage table. If you are pregnant then we have a special “Zero Gravity” reflexology chair that is safe and comfy to lie in. The reflexologist begins the treatment by washing your feet in warm water and essential oils and then eases into the treatment with a gentle massage and relaxation techniques on the feet, allowing your body to become relaxed and ‘mind chatter’ to cease. As the treatment gets underway you will fall into a deeper level of relaxation. Some clients describe the experience as drifting in and out of conscious awareness, often dreaming yet still being aware of the treatment. Others report feeling an ‘energy shift’ taking place, feelings of warmth, tingling, a flutter or other pleasant sensations. Your body will take what it needs from a treatment. Reflexology can result in an increase in energy, a boost in the immune system, a reduction in pain or calming down of the mind. Many people report feeling both calm and energised after a session and everyone walks away with refreshed feet, feeling as if they are walking on air. A series of sessions may be required if the condition is of a chronic nature. Regular reflexology sessions are beneficial in maintaining health and wellbeing. Often imbalances within the body appear on the feet before it’s obvious to the individual, so prevention may be implemented. As a professional fully qualified reflexology registered with the Reflexology Association of Australia ( RAOA) we qualify for health fund rebate if your insurer covers reflexology. Please check your personal health insurance. Below is a list of Private Health Funds who offer rebates under their extras cover for Reflexology Treatments.